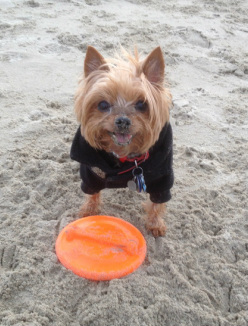 My 7 lb Yorkshire Terrier, Diva was born with a congenitive disease called Liver Shunt. She arrived by plane as a puppy looking rather scraggly. Her coat and demeanor somehow indicated that she wasn't very healthy. Soon after her arrival, each time we played, she began to hack, then retch, then spit up a foamy substance. My poor baby seemed sick. I mentioned this to the breeder and she coldly suggested I ship her back as if she were a rejected pair of shoes. So I kept her and was determined to find out what was wrong. I took Diva to many vets and they all had their own notions. Some said it was a collapsed trachea, some said her parents were highly toxic from shots and chemicals, some said I was feeding her wrong, everyone was an expert and I was drowning in everyone's advice. From traditional to holistic vets, no one got to the issue at hand until I desperately sought help from an internet chat site called YorkieTalk. 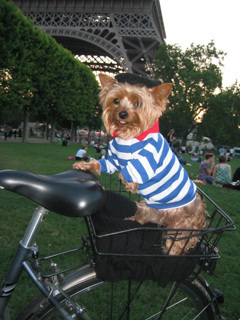 It was there that I met a fellow Yorkie lover who recommended I take Diva for an $80 Bile Acid test. Well, it turns out that she did have Liver Shunt. My husband and I immediately rushed her to the hospital for corrective surgery. However afterwards, we weren't out of the woods, we were told that Diva would need to be monitored for the rest of her life and most specialists recommended medication and dead bland canned foods. I was beside myself and didn't know what to do. It was around that time that I was blessed to have met you and started working with you shortly after. For over a decade, I received never ending devotion that guided and educated me on how to support Diva in living a healthy life thru diet, supplements and plenty of love. Diva is almost 12 years old and is still on your diet regime, still taking the supplements that you suggested, and sustaining a full life. She smiles all the time, loves to play frisbee and fetch the ball. She is the picture of health to everyone who meets her and I know that she would have been long gone had I not had guidance from you. Since Liver Shunt runs rampant in toy dogs, and there are many suspicious puppy mills hidden behind fancy internet sites, I suggest that anyone shopping for a puppy demand that the breeder has the dog undergo this Bile Acid Test. If they refuse, you don't want this breeder. I tell you, I was lucky, many dogs suffer and many people's hearts are broken.